: : Promotional HD videos for authors for viewing on the Internet etc. Announcing the re-release of the treasured Paint Along with Nancy Kominsky oil painting series as broadcast on PBS from 1975-85. The Galloping Gaugin, the Julia Childs of how-to oil painting, shows you how to complete an entire painting in almost 30 minutes. 20 complete lessons on 10 DVDs(2 per disk). 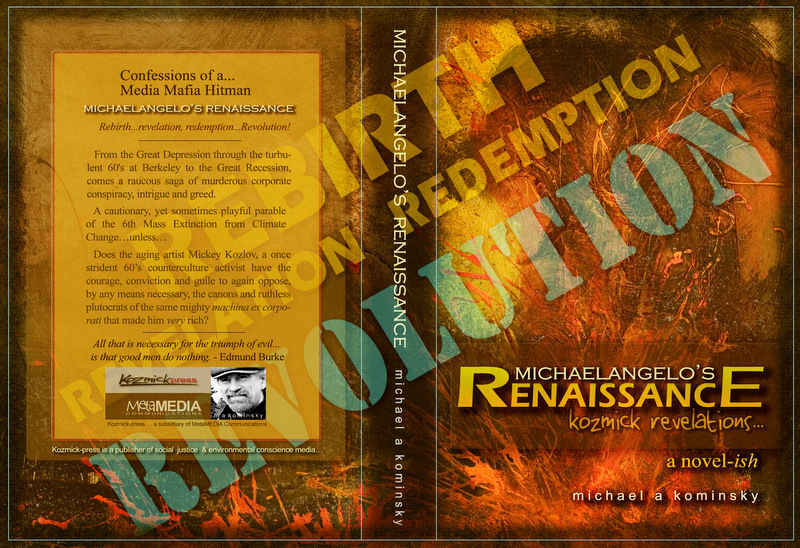 Initially, the first two lessons, to be released on September 15th on the first DVD, available on Amazon.com, with other lessons to follow. High quality video, digitized and enhanced to a 16:9 HD format, which will play on a standard DVD or Blu-ray at full screen…with NO side “pillars”. Details to follow. Two full lessons on one DVD at a great introductory price of only $19.95 plus S&H. That’s one hour of instruction which will give you for two beautiful, rich in vibrant color, complete paintings! Plays in all regions. NTSC video will play on UK PAL DVDs. Sadly, the anticipated level of interest necessary to justify the considerable capital investment of producing the series﻿ has not (yet) been realized. The production of the project will therefore be held in abeyance until further notice. 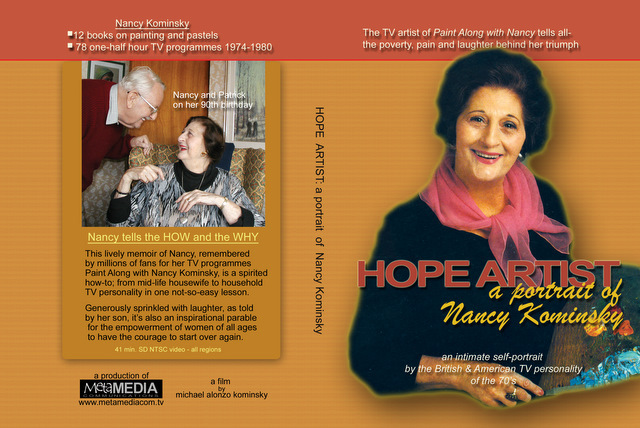 Nancy Kominsky who died on March 11, 2011 at the age of 95 leaves a legacy of hundreds of aspiring artists who were enthusiastic followers of her televised programmes, Paint Along With Nancy in the 1970s. She is preceded by her beloved and devoted husband, Patrick Armine Wodehouse(b 1920) on January 29, 2011. Her series “Paint Along with Nancy” comprised 52 half-hour programmes made by HTV West from 1974 to 1978 and transmitted on ITV in the United Kingdom, and 26 one-half hour programmes were made for PBS in the United States and ran on PBS affiliates into the mid 1980’s. 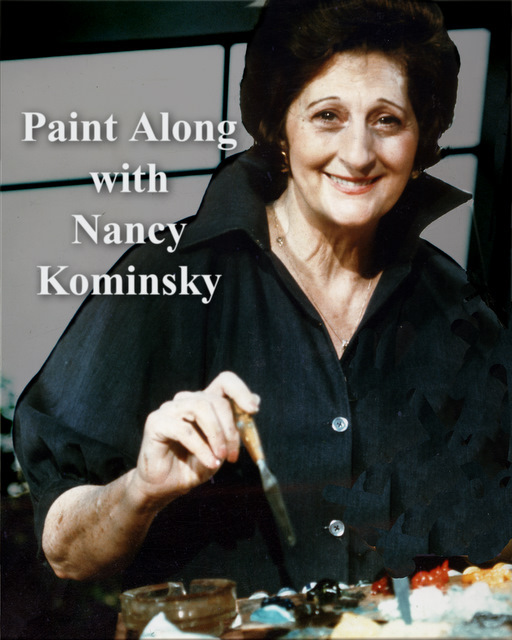 Nancy Kominsky is also the author of 12 books on painting and pastels, which are no longer in print but are available at various on-line used-book stores. The programmes went out once a week in the afternoons, and after the first, HTV was receiving such a deluge of fan mail they had to hire several clerks to deal with it. Her oil painting lessons were followed with enthusiasm by housewives, shift workers and school children, many of whom today recall racing home after school to switch on the television set to watch her demonstrate her unusual system of painting with an amusing, unscripted running commentary. To demystify painting with oils and mixing colours, she used her own kitchen-sink method: “For the background, mix a teaspoonful of orange, half a teaspoon of vermilion and quarter of purple…” and she always finished within 30 minutes with a picture her fans could copy. The series extended over four years and was shown extensively abroad. No one watching her exuberant showmanship could have guessed at the miserable poverty of her childhood in America during the Great Depression. She was the eldest of five children of Italian immigrant parents, and her father abandoned them all after the Wall Street Crash. With a mentally unstable mother, Nancy, aged 15, took over, earning what she could with odd jobs, often hungry, but always with her sketch book to hand. After a marriage and divorce, she supported herself and two children by giving painting lessons. Then at the age of 50, having only once ever left the shores of America, she packed her bags and sailed off to Rome to open a studio and teach art. On arrival she saw a notice in the local English-language newspaper of a meeting of what she assumed to be the “Artists Association” and she went in the hope of finding some likely pupils. It turned out to be an Alcoholics Association meeting but she managed to recruit a few pupils, the nucleus of her teaching studio in Rome. A few years later Patrick Wodehouse, nephew of P G Wodehouse became one of her pupils. They married and had 27 happy years together, living in Wimbledon when they left Rome. She leaves a son and daughter by her first marriage who live in America. With a secret hand I relieved as many misfortunes as I knew of. Always with true faith my prayer rose to the holy shrines. Vissi d’Arte from Tosca by Puccini, I believe, captures the essence of Nancy’s life. Nancy truly lived by the opening libretto. I lived for my art…I lived for love.. I never did harm to a living soul. Musicians and artist have much in common…both require great passion…and almost an obsessive commitment to fulfill one’s potential. And Nancy was nothing, if not intense about her art. It was not an easy life for Nancy, being an artist. But many times, it was her passion for her art, that sustained her when faced with the many daunting vagaries of her life. Like many truly committed artists and musicians, she could distract and defuse the difficulty of her personal situation, by burying herself in her art…a painting or, always with sketch pad and pencil, by drawing someone she saw sitting on a park bench. In many ways Nancy’s life was like one very long lyrical opera…with innumerable twists and turns in the plot…the heroine facing seemingly insurmountable challenges, but somehow in the end, always prevailing. Tosca, but with a much happier ending. And like most operatic narratives, for Nancy, there were triumphs and defeats. Always with great humility when victorious, always with great grace when not. But the one common thread through all of Nancy’s trials and tribulations, was her irrepressible faith in a benevolent, loving God and in the Crucifixion and Resurrection of the Christ, which also served as a metaphor for her own life…death and rebirth…countless times. Nancy was the original, albeit, accidental feminist…quintessentially feminine, yet fierce in defense of her rights, and those of other women in difficult, often abusive relationships. Those who knew Nancy well, would also know that she had a flair for Diva Drama in her own life…her large expressive, penetrating clear green eyes, dancing to the rhythm of those animated hands, while passionately telling a story…or just commenting on an article in the morning London Telly about someone’s misfortune. She was always for the underclass…always remembering where she had came from, and always full of compassion and empathy for the underdog. -Would it be the fame and notoriety of being an almost cult television celebrity at mid-life? No. – Or how about being the author of 12 books on painting and pastels? I think not. No…I think she would say that the most prized and important part of her life, was all about the relationships she had formed and nurtured with the many people in her life…her beloved husband Patrick Wodehouse, her many, many devoted friends. Most of which, sadly, she outlived. Nancy truly loved and prized her many friends too numerous to list here…and she often said to me that she owed all of her success to the kindness and generosity of her many friends, whom she loved and adored. But I believe that she would be the most proud of her role, as the mother of her two children, whom she unconditionally loved. One of which, as a sickly child, she would spend hours upon hours, caring for, nursing and healing–always with great love and affection. But the most healing quality of all was that “thousand watt smile” that could light up a room, flashed at will, even under the most trying of circumstances. Nancy, by the way, was not, thank God, what one would call a traditional Mom. While most kids grew up awakening to the smell of bacon and eggs sizzling in the skillet, I can recall the distinct pungent aroma of turpentine wafting up my nostrils…yep…she’d be in the kitchen furiously painting, humming and singing away, often from dawn…because that was the only quiet time she could find for her art, which she subordinated to raising her family. Growing up, her art inflected and I must say infected every aspect of our lives. Painting with one hand, while preparing the starving artist’s staple, tuna casserole with the other…sometimes confusing the two…yielding what I dubbed the Specialty of the House, Tuna Alla Turpentina. And so it was…on that lovely Saturday afternoon in September, in a private civil ceremony in Wimbledon, with several close friends, Nancy Agneta Kominsky, aged 68 become Nancy Agneta Kominsky Wodehouse, wife of Patrick Armine Wodehouse. And, I was there to give the beaming bride away. It was the beginning of a beautiful, almost mythical love story, and a near 28 year honeymoon. Nancy-and-Patrick…usually uttered as one word. Over the years, Patrick and I had become very close. I could not have loved him more if he was my own father. His kindness and love toward my mother was most exceptional, and yes, inspiring; a beautiful sight to behold. In the later years he was her primary caregiver…unselfishly taking care of all of Nancy’s needs, including doing all the cooking, which I think he rather relished, and became quite a creative and proficient chef. He was witty, a good raconteur, great company, and was totally devoted to Nancy, and she to him. They were an inspiration to others around them, about the power of love and commitment in a relationship…and they sure knew how to throw one heck of a party. Sadly dear Patrick passed away on January 29, 2011. Nancy, my dear sweet Mum, would soon follow on March 11, 2011. Before she passed we had three wonderful weeks together, which I will always be grateful for…reminiscing about my childhood and all the crazy escapades we had shared together. On the last day I spent with her on March 8th, before having to return back home to the States, we said our final goodbye…sadly, she knew it…and I knew it. I can tell you that she was as fearless facing death, as she was facing the many personal challenges and the myriad of health problems later in her life…her irrepressible faith in God sustained her…facing death…as it did all through her life. My Mother was, and always will be, my hero…her joi de vivre and lust for life inspired and informed mine…and we shall miss the sound of her laughter, and the joy she took in the simples pleasures of life. Dinner with friends. The simple elegant beauty of nature, and the joy and pride Patrick and Nancy took in their surrounding garden. We shall never forget Nancy and Patrick…I am grateful for the long and productive lives that they were given, and their peaceful passing, both warmly wrapped in the arms of Morpheus. They are together again…and I’m sure by now, starting to plan their next big, very big, dinner party. We would very much like to thank everyone for attending Nancy’s Service. Of her many friends and family here today, we would like to especially thank Yvonne Thomas, who collaborated with Nancy in writing her autobiography, “This Is How I Did It: Nancy Kominsky”, which by the way was a prize-winner in the 17th Annual Writer’s Digest Competition in 2010. The Committal Service will commence at exactly 11:30 at North East Crematorium, in Surrey. Because of the challenging scheduling at the Crematorium, the service conducted by Father McMillan will be very brief. Attendance of course, is optional. But we would ask that only Father McMillan and members of the immediate family attend. We offer instead for our guests today, a reception, a celebration of Nancy’s life, here at the Sacred Heart Church Lounge. Refreshments including, a light bill of fare, pastries, coffee, tea and wine will be served. Enjoy. And again, our most profound gratitude for your attendance. 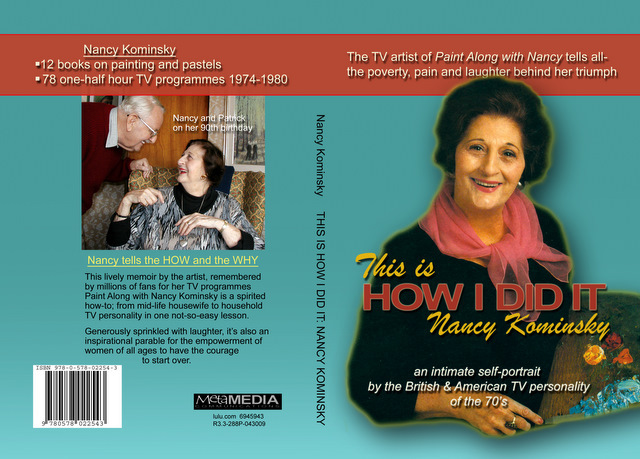 An intimate portrait of the British and American TV personality of the 70s – Paint Along with Nancy Kominsky – 10 years on PBS and ITV UK. The companion book, This Is How I Did It: Nancy Kominsky is a recent Prize Winner in the 17th Annual Readers Digest Competition (2010). A one-hour film shot on location on Lopez Island, San Juan Islands in Northwest Washington, featuring in-depth interviews with Felicity Green, colleagues, students. friends and family, and residents of Lopez. 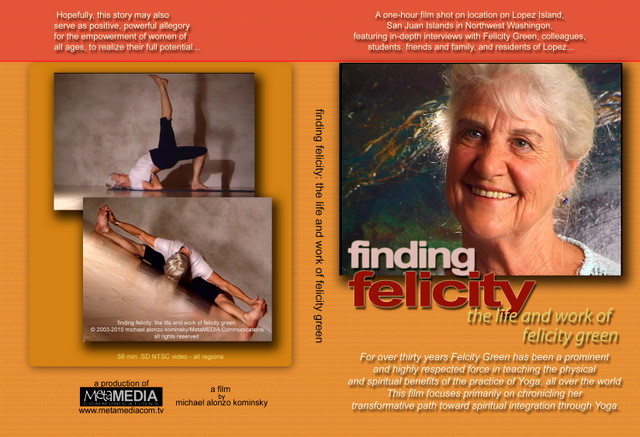 For over thirty years Felicity Green has been a prominent and highly respected force in teaching the physical and spiritual benefits of the practice of Yoga, all over the world. But there is a much more important and compelling story about her life, other than her dedication to Yoga. Hopefully, this story may also serve as positive, powerful allegory for the empowerment of women, of all ages, to realize their full potential. The film focuses primarily on chronicling her trans-formative path toward spiritual integration through Yoga. 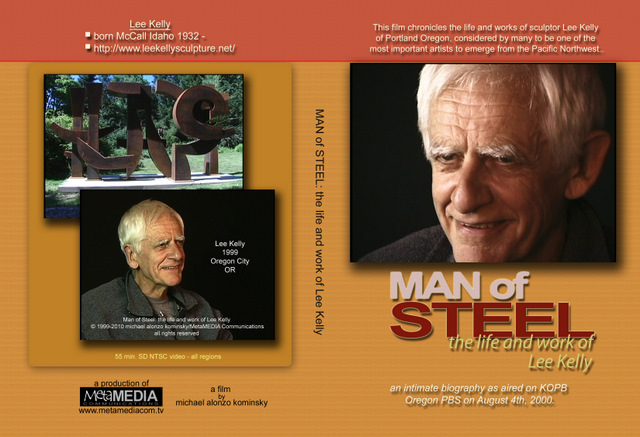 This film chronicles the life and works of sculptor Lee Kelly of Portland Oregon, considered by many to be one of the most important artists to emerge from the Pacific Northwest.. It has been said that Lee Kelly(b. 1932-), of Portland Oregon, is a sculptor’s sculptor. 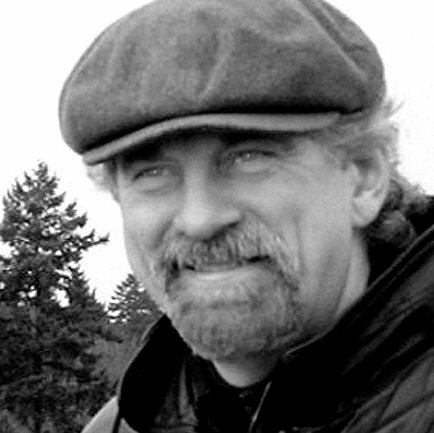 He has had numerous on-man exhibits in the Pacific Northwest and the U.S.
His public works commissions include many very large and important pieces: City of Bend OR, University of OR, to name just a few. Interviews with collectors and gallery operators, as well as Lee’s very personal and candid discussion, reveal the essence of his persona and creative process. The main focus of the artwork, is the impressively large outdoor fabricated/welded steel forms. More than a biography, it is an allegory for the triumph of the human spirit over adversity, and how that struggle intensified and enhanced the creative process of Lee Kelly. This particular release of the film aired on KOPB, Oregon PBS, on August 4, 2000.